As a gift to my friend who recently married, I decided to make a bed. 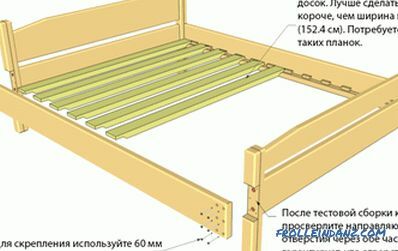 I carefully planned the work, even found on the Internet a project to build such a bed, which describes in detail how to make a double bed with your own hands, though, in the end, I had to retreat somewhat from this project. 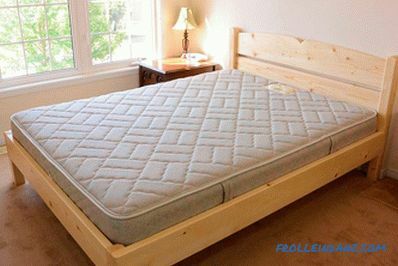 To make you understand the whole process of making a bed, at the beginning of this material, we placed a project used by the author of this article. 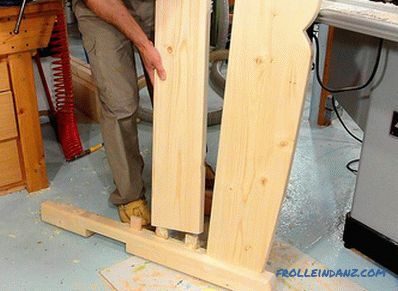 On the basis of this project, you can easily make your double bed. 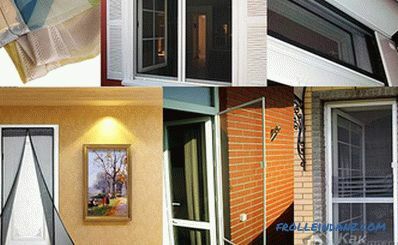 The list of materials below assumes that they are all of good quality. 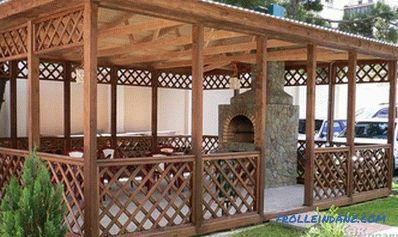 In fact, you must purchase more lumber than is listed in order to be able to reject fragments with defects (knots, curvatures, cracks, etc.). 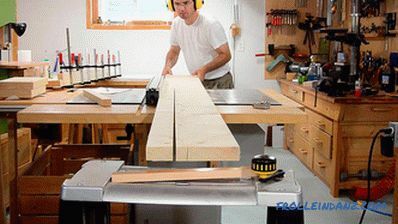 Right are those who buy lumber larger than required, the width and cut out of them the desired size of the workpiece. 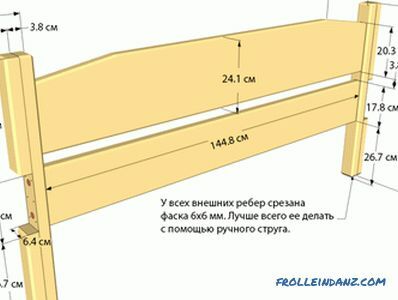 As a rule, the larger the width of the plank / bar, the higher the quality of the wood (narrow boards are cut from the trunks of thin, low-grade trees and often end up deformed). 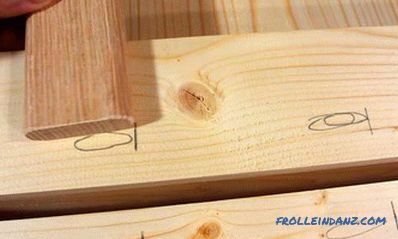 * Instead of boards marked with an asterisk, it is better to buy six 5x25x240 cm boards and cut from them blanks of the necessary size. 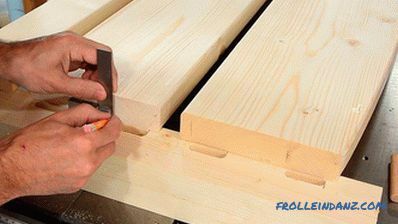 Cut-outs at the ends of the rails ensure that the latter will not add too much height. 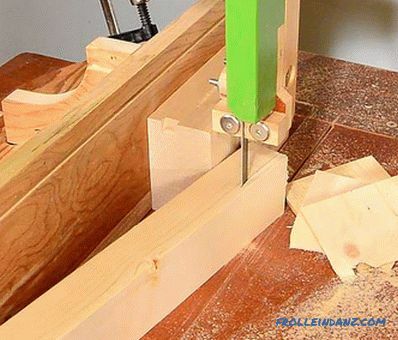 Holes for dowels should be done by clamping together with horizontal clamps fragment headboard and leg. 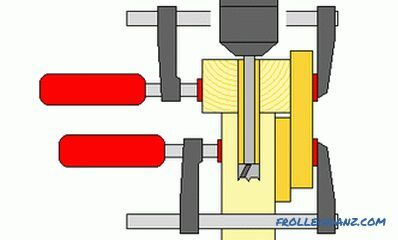 Drill a hole through both parts at once, as shown in the figure. Each side bed fence has a number of bars on the base bar. 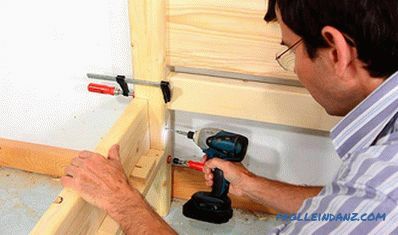 The purpose of these bars is to prevent displacement of the bottom rails. 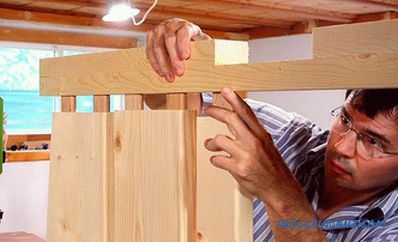 The 4x4 cm bars, which will hold the weight of the bottom of the rack, are best fastened to the glue and screws. 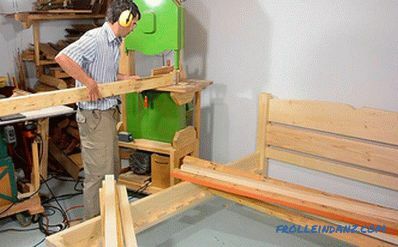 The side rails are fixed when the bed is installed in its permanent place. 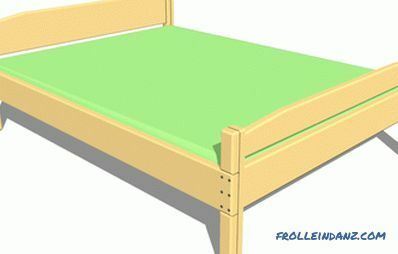 To move the bed frame they should be dismantled. 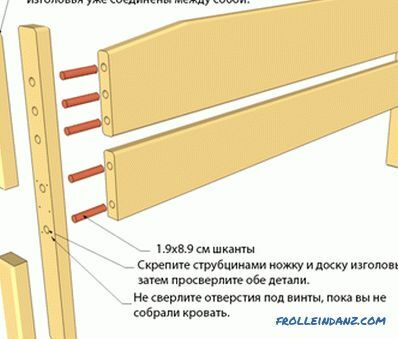 The laths that make up the rack bottom are not fixed. 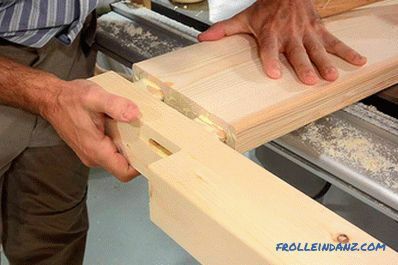 Slipping them along the support bars prevents small wooden blocks. Next we pass the word to the author of this material. 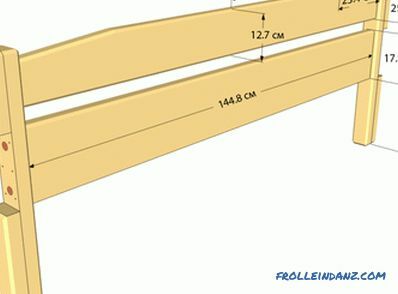 I purchased boards with a section of 5x20 and 5x25 cm. 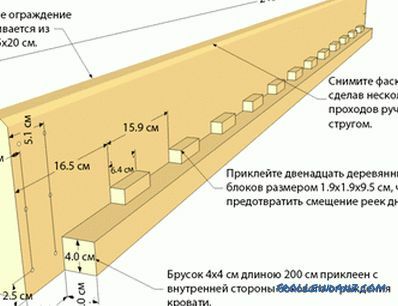 In my project, 5 cm thick bars are also used, but I didn’t buy them, deciding to make them from existing lumber, because wide boards were much better quality. 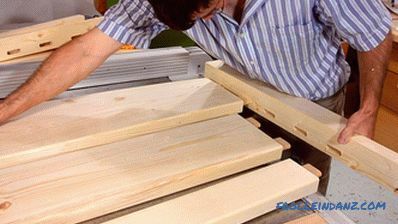 I purchased the wood already planed. 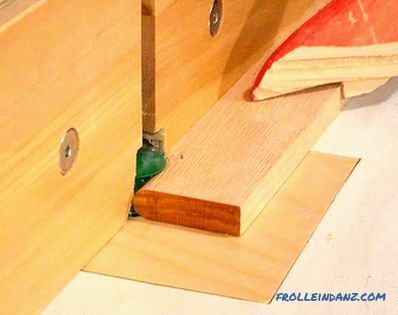 It is enough to remove 1 mm on each side to get a perfectly smooth surface. 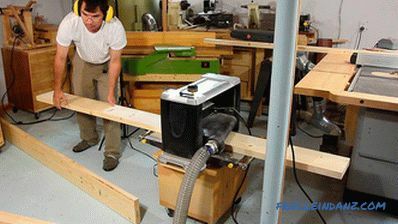 I used a home-made jointer for processing the sides of the boards. 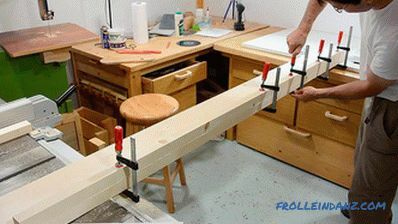 Now it's time to shorten the lumber to the desired length. 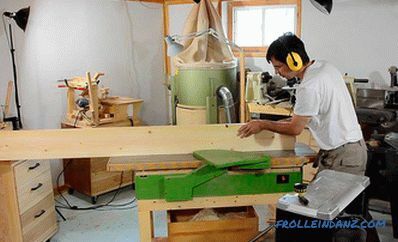 Since the boards are very long and protrude far beyond the workbench, you have to strongly press them to the table top to prevent the machine from tipping over. 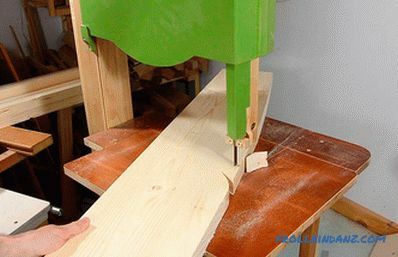 In this case, a sliding miter saw would be useful, but I don’t have it, and there is too little room in the workshop to install it. 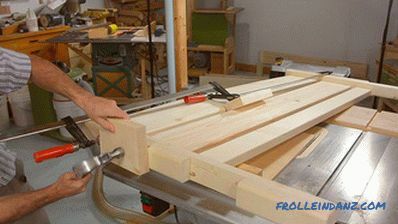 Here you can observe the process of making the side bed fencing. The 4x4 cm bar, which will serve to hold the bottom of the rack, is glued to the lower edge of the side wall from the inside. 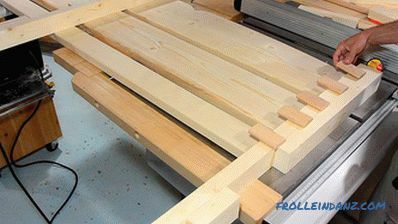 Having glued the bars together, I got legs for the head of the bed. 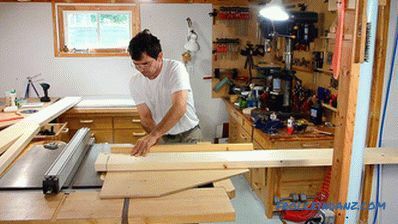 After the glue had dried, I leveled the glued edges together with a jointer. 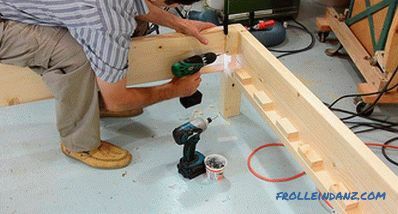 In accordance with my initial plans, I had to increase the thickness of the legs after the headboard assembly, so that I could drill holes in both parts at once.But I changed the sequence of actions, and it soon became clear that it was much more convenient to glue the elements of the legs together before attaching them to the headboard. I thought it would be nice to give the top of the headboard a smooth curved shape. Using the BigPrint program, I made a half profile printout, and transferred the outline to a tree. 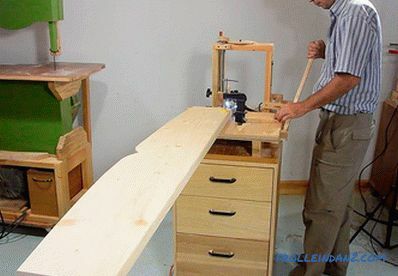 Most of the headboard is a smooth curve. 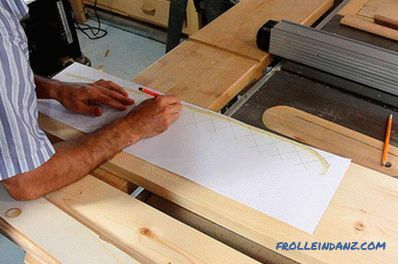 I used a flexible wooden plank to smooth the line I drew. ... and smoothed the defects with a hand plane. I rounded all edges of the headboard. 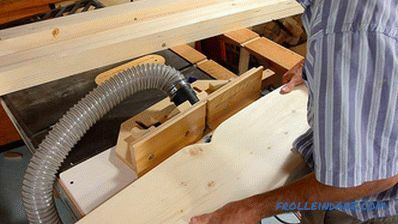 In fact, all the open edges of the bed frame are cut with a chamfer of 0. 5-1 cm. In this photo you can to see how I made the layout of the location of the spikes, which will fasten the elements of the headboard. 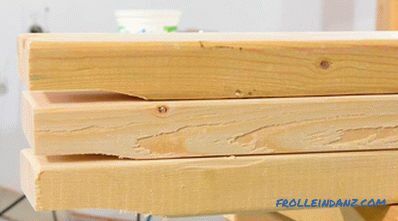 After the marking was done, I cut out the grooves for the spikes in the legs of the bed using a drilling-grooving machine. I rarely use it, but it is a really good tool for this task. Having cut the grooves in the legs, I used a small square to mark the location of the spikes in the ends of the boards that make up the head of the bed. 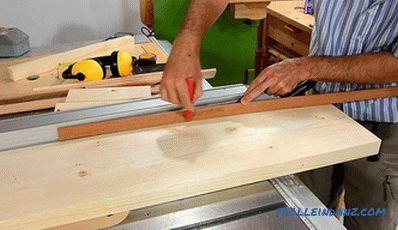 Cut out the grooves in the ends of the headboard. 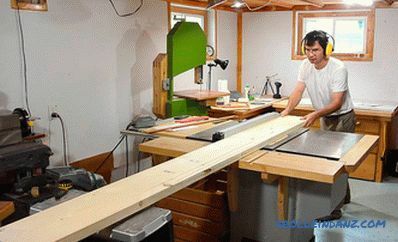 Almost a half meter board hanging far beyond the workbench didn’t cause much trouble. 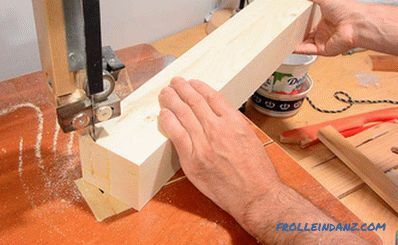 The workpiece remains motionless, however, if necessary, I could install additional support. Assembled the head of the bed. 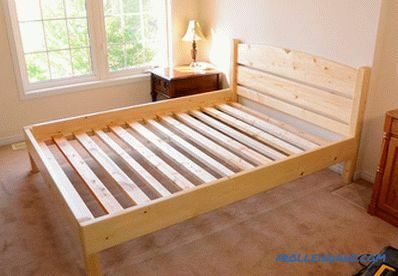 The bed frame is assembled fairly easily. 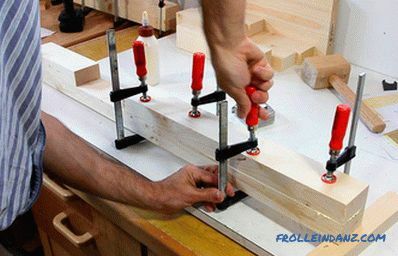 Even without glue, the reliability of all connections is beyond doubt. But this is not the final assembly, I just check how the elements fit together. The turn of the rack bottom has arrived. The slats covering the entire width of the bed (1. 5 m) are made of 5x10 and 5x7. 5 cm bars. This is mainly used wood, which I stored for later use. 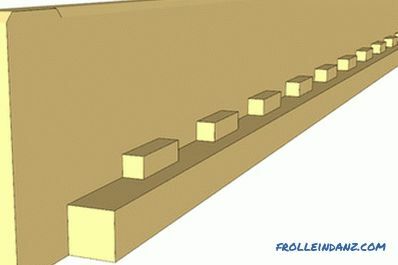 To prevent the slats from moving, I pasted small wooden blocks between them. 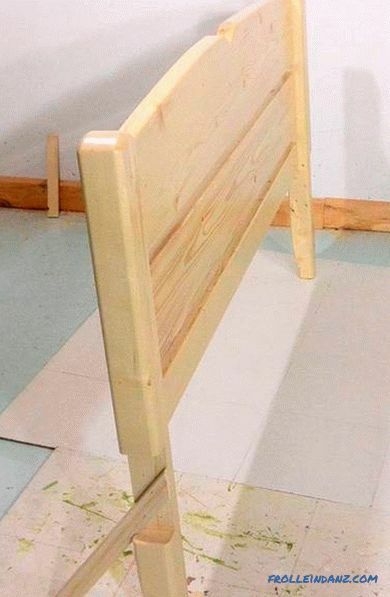 I slightly reduced the thickness of the ends of the rails so that they “sat down” just below the bed frame. 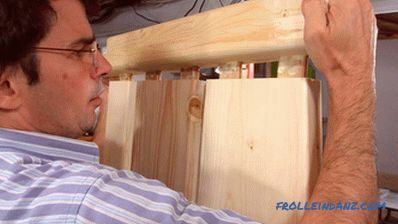 At the same time, he did not forget to ensure that the top surface of all the bars was on the same level. 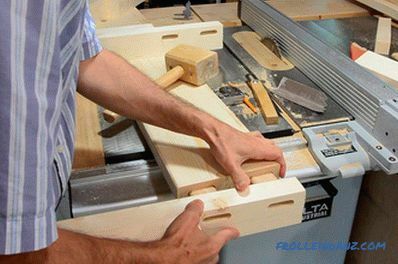 Thus, even if the slats were of different thickness, this non-uniformity will eventually be leveled and the upper surface of the plane they form flat. Now back to work on the headboards. I rounded off all external corners, having cut off ~ 6 mm a facet. Then glued together the structural elements. 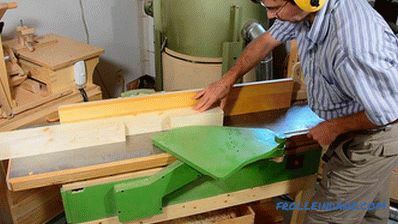 The photograph shows the process of gluing one of the legs to the headboard. 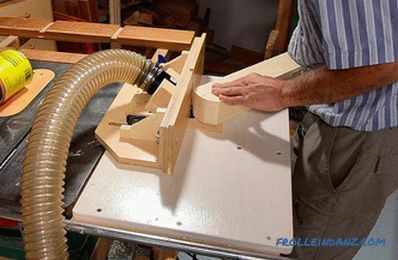 I rounded the upper parts of the legs, located at the head of the head, so that they harmonize well with the curved profile of the headboard. Then I rounded three of the four edges of these legs, cutting 12 mm into the bevel. In addition, I slightly squinted lower part of the legs located at the head of the head. 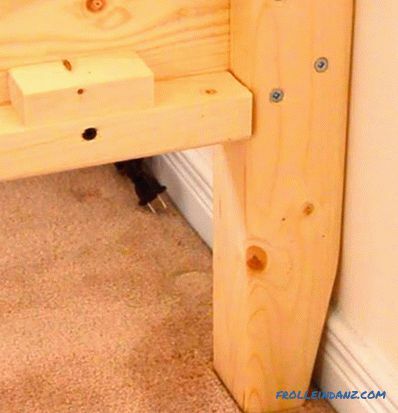 Due to this, the bed can be placed close to the wall, and the baseboard will not interfere with that. I glued the headboard. 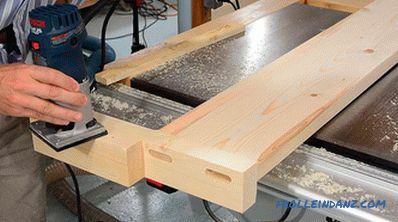 On the floor, as it turned out, it is much more convenient to work, because the ceiling in my workshop is too low to put the structure vertically on the workbench. 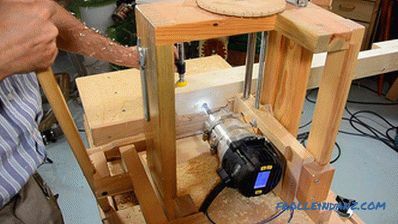 ... so I had to use two clamps, a scrap of board and a hammer. 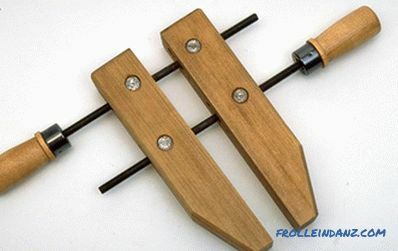 Thanks to this uncomplicated set of tools, I not only inserted the spikes into the grooves, but also eliminated the gaps. Now we connect the back of the head with the side walls. Initially, I planned to screw the screws fastening them together from the outside, but during the work I realized that I was able to twist the screws from the inside, thus hiding them. I drilled a guide hole through both parts, and then pulled them with 60 mm self-tapping screws. 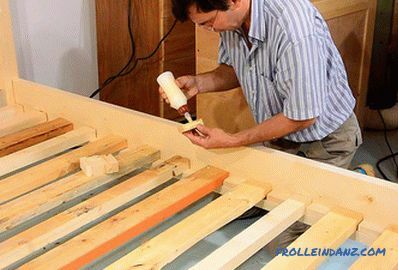 Having made the same back of the second headboard, I proceeded to covering all the elements with varnish. I screwed a small bar to the back of the headboard so that she could now stand on her own legs. The remaining parts at the time of varnish coating, I placed on my workbench. I applied two layers of varnish on the inside of the frame and three layers on other surfaces. 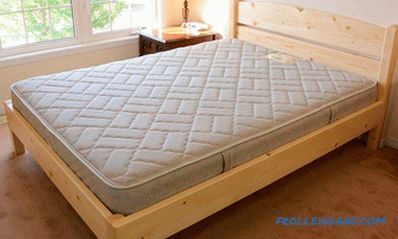 The back of the headboard is covered with four layers, since it is more susceptible to wear. 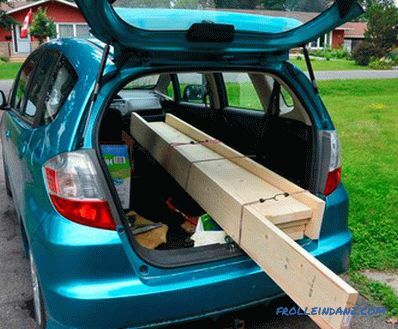 It is time to transport the bed to the new owner.Fragments barely fit into my Honda Fit, however, the tailgate could not be closed. And now it is already assembled, with a 25 cm mattress. My buddy was delighted. He had long wondered how he could make a double bed himself in such a short time. 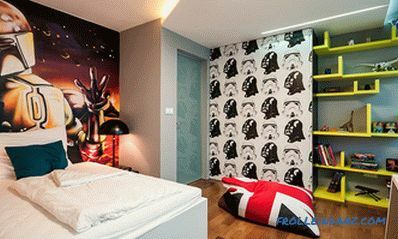 But his young wife really liked the presence of storage under the bed, where you can place a lot of suitcases, boxes and boxes. Despite the fact that the author speaks English in the video below, we decided to publish this video. After reviewing it, you will better understand certain aspects of this article, the more it is so interesting to watch how others work :).